The healthy food scene in London is incredible and I love to explore and discover new amazing cafes, restaurants, shops and products each time a take a little trip over there. I thought that I would compile a list of my fave places for food in London, as well as some products and places that I would love to visit. There are so many cafes that I have yet to try so I would love to hear your recommendations too! Farm Girl is heaven for health food fanatics like me. It was set up by two Aussies in the bright and bustling neighbourhood of Notting Hill. Smashed avo, açaî bowls, buckwheat pancakes and jackfruit tacos are just some of the mouthwatering dishes available on their amazing menu. They cater for everyone from vegans to paleo, whether you are gluten or dairy free, even both, they have plenty of options. Not to mention their amazing rainbow of lattes that they serve, charcoal, liquid gold and blue matcha are just a few. Also, a bonus, everything is completely instagrammable! They also have a cafe in Soho serving smoothies, smoothie bowls, salads and more, a s well as a cafe/restaurant in Chelsea that serves brunch and dinner. I have been following Ella for ages and even got the chance to interview her, so I was ecstatic when I got to try her cafe in the lovely area of Marylebone. My mum and I arrived late morning and were just in time for brekkie before the lunch switch. We both decided to go for the same thing, loaded banana bread, yes you heard me right. Banana bread with coconut yoghurt and compote.... so delish. Everything on the menu looked amazing and I would love to try the lunch selection and treats next time I go. 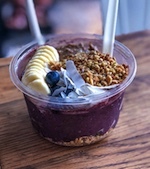 Juicebaby has the best açaí that I have had in London - thick, creamy and full of flavour. I love the açaí berry bowl and it comes topped with granola, banana, bluebs, coco chips and I add almond butter (of course). They have two cafes - one on Kings Road and the other in Notting Hill. Juice Baby also have a delish looking range of smoothies, salads and sweet treats which I have yet to try. Farmacy, to me, is the best place for a plant-filled vegan dinner in London. Every single time I go, I am amazed at how good the food is. I also love the look of the restaurant, their are plants hanging everywhere and it has such a cool modern-decor. I have so many faves from the menu but i will just narrow them down to a few. To start I love the nachos and the sweet potato falafels, for mains, the Mexican and Middle Eastern bowl are always amazing and so is the burger with sweet potato fries. Now onto dessert; I can't go past the Nice Cream Brownie Sundae.... the absolute dream (P.S - the cookies rock too!). VEGAN AND GLUTEN FREE PIZZA.....YES PLEASE! I am serious when I say I was mind-blown by how I had a vegan and gf pizza that tasted like the real deal. To be honest, I was expecting a limp, cardboard-like base with soggy, tasteless 'cheese', but that is the opposite of what I got. The base was perfectly thin and crispy with a lovely tomato sauce, basil, cherry tomatoes, mushrooms, vegan pesto and a stretchy, flavourful 'mozzarella' on top. I highly recommend hitting this place up to get your pizza fix. Health foodie heaven. They have a full aisle of healthy chocolate..... need I say more? Healthy puffed chippies made from chickpeas? Yes please! 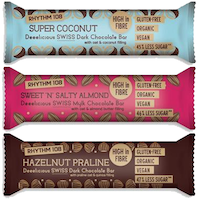 These natural bars are made from simple ingredients (dates, nuts, powders etc.) and are oh so tasty. Booja Booja do the most delicious and creamy vegan ice cream as well as the best EVER chocolate truffles.